For a lot people, the thought of managing a website can be a little overwhelming. Most people who need websites would certainly love nothing more than to point and click and have the content they type be automatically displayed on a web page. The beauty of using a content management system is that it enables website owners to do just that, and more. However, not all content management systems are built the same though. Naturally, some will be easier to use than others. In your current CMS, just how easy is it to assign a newly created page the functionality of another plugin or module? With the Lunasoft platform, assigning pages to take on functionality is as easy as editing the page itself. Simple visit the "Advanced" tab of the page editor and select which module you would like that page to take on. For example, setting the page to "Blog" would output all of the blog posts that you wrote in the blog manager directly to the page. In addition, the software would also output other useful tools on the page, such as search functionality and ordering functionality. 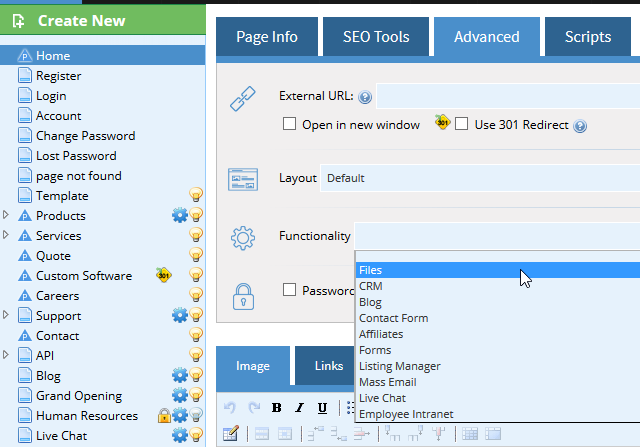 Wondering how easy it would be to manage your own blog with Lunasoft? Contact us today for a demo!